Providing health and social care is hard. Running a business is hard. Delivering public services for tax payers is hard. So it is amazing to find the ways that community businesses and other types of social enterprises find ways of doing all three of these things at the same time, even under difficult circumstances. This has been the findings of recent research on community businesses that provide health and wellbeing services conducted by Middlesex University and Social Enterprise UK for Power to Change Research Institute. Our research has explored how social enterprises or community businesses that are locally rooted and accountable to their communities are able to provide a range of health and wellbeing services. These services go beyond the ‘biomedical’ focus of hospital-focused health and also involve a wide range of community and public health that might otherwise be missed. They do this by linking a range of different approaches, including specific therapeutic services for those suffering from mental and physical health conditions as well as the provision of supportive spaces, building self-esteem and vocational skills, and tackling social isolation and loneliness. This is made possible through contracts from the public sector, state provided personal budgets that users can spend, people spending their own money on wellbeing and fitness, as well as different forms of charitable fundraising. By being community focused they are able to work closely with the users whilst drawing on a range of community resources. Most important of these are the relationships (that create bridges between parts of society and bring in volunteers), and the space or buildings that can bring people together. However, none of this would be possible without social entrepreneurs who can combine the three elements mentioned at the start: social, commercial and public service objectives. To be innovative, they have to find ways of navigating between these different objectives. As community business leaders develop strategies to grow and survive, we have found they have address certain dilemmas. The first is whether all their income generation should be focused on their core objectives (mission integration) or a ‘cash cow’ source of income to make a surplus and fund their work. The figure below shows the different strategies they can adopt. The top left relates to large financial surpluses but without so much social value. This ‘cash cow’ can cross subsidise the bottom right quadrant. However, an over emphasis on cash cow can lead to a ‘mission drift’ away from the core objective of the community business. 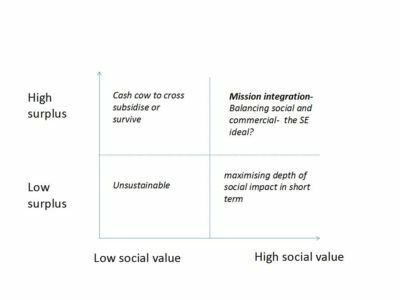 There is also a risk of an over emphasis on the bottom right quadrant if maximising social value without a sustainable income stream. This is the most common way for good organisations to close. Of course the bottom left quadrant of low social value and low financial surplus should be avoided at all costs, but we still find it when older cash cow enterprises continue even when not making the surplus they once generated. The social enterprise ideal is in the top right hand quadrant where community businesses are paid for delivering their core purpose. The second dilemma is the big growth question: should you grow your organisation to reach a bigger population or will this lose the community focus? Some organisations have growth strategies and others explicitly seek to stay small and focused. But ‘scaling up’ does not have to mean only growing a single organisation. It is also possible through encouraging others to replicate or adapt and have a thousand flowers blooming. This leads us to third dilemma: Whether to encourage others by sharing all your knowledge, or hold on to your intellectual property so competitors don’t take income from you. Giving all your innovations away might be a way of maximising social value, but it might be at the cost of survival of the organisation. We can look at this in another way. Social enterprises should be the hotbeds of innovation as well as delivering excellent services. They need to cover the costs of their innovation (or be funded to innovate), but also be ready to hand over knowledge and move onto the next innovation. Funders should be paying for and encouraging this. The fourth dilemma relates to balancing independence with being a subcontractor beholden to a large organisation. Many organisations decide to grow through having such contracts and have to find ways of meeting professional standards and targets. Working with volunteers becomes harder in such cases. Increasingly, smaller organisations are being excluded from leading bids by the requirements to have a large organisation with financial reserves. While the Carillion case shows that such regulations can be misguided, small organisations have to decide between joining or withdrawing from such relationships. The fifth dilemma relates to coping with contraction when withdrawing from services, funding finishes or contracts are not renewed. Community businesses have to decide whether to ‘chase the money’ to fill the financial shortfall or accept the loss of income. The former strategy can result in the growth of the organisation but can risk mission drift as there is an overemphasis on commercial objectives just for firefighting and survival. Managing contraction of organisations requires difficult decisions regarding staffing and also how to continue to serve vulnerable users or members. Even in such difficult circumstances, many community businesses are flourishing and providing innovative services that complement and address gaps in established private and public service provision. Others are precarious and have to find ways to survive. They are able to tackle the challenges of combining social and commercial objectives at the same time. This might be done instinctively and some able to do this refer to just ‘getting it’ or having the headspace to combine such different things. This is the incredible capability of community businesses and social entrepreneurs. They have to be public service providers. They have to have strong businesses. And most importantly, they have to be highly skilled and experienced in providing healthcare and support.